One Cool Tip .com: What's Going On? 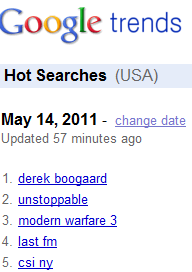 Let Google Hot Trends Tell You! As many of our lives move to digital for our daily information and interaction, it's not surprising that we turn to search engines like Google for answers on current events. A quick way to get a pulse on what's happening in the world is to visit Google's Trends page at http://www.google.com/trends/hottrends Updated regularly, it lists the top trending search topics that are appearing in the Google search engine. Clicking a link reveals additional news stories and blog posts for that search term. Want to know what's going on? Let Professor Google tell you. He knows.